37th Field Ambulance, Royal Army Medical Corps. William Henry Haddon (or Hadden) was born in Beeston in 18972, the eldest of six children of William and Elizabeth (née Foulk) Haddon. William and Elizabeth had come to live in Beeston soon after their marriage in August 18963. William had found work as a labourer at Beeston Foundry which had recently opened there. By 1901, the family, now with three children including the young William Henry, aged four, was living at 27 Salisbury Street, Beeston4. By 1911, the family, now including all six children, had moved to 12 Humber Road South, Beeston, By that time, the fourteen-year-old William Henry had started work as a printer5. Although his Army Service Record has not survived, it appears that William Henry enlisted in November 19156 with the Royal Army Medical Corps. We have found no recorded date for his arrival in France, but it seems likely that, after a period of training in England, he would have joined 37th Field Ambulance, a vital part of 12th (Eastern) Division, in time for the Battles of the Somme which got underway on July 1st 1916. The 12th Division had been formed in August 1914 as part of Kitchener's First New Army and had seen early action and had continued to do so throughout 1915 and 1916. In its mobile role, positioned close behind the front, 37th Field Ambulance received wounded men, gave basic treatment at the front-line aid posts and, as appropriate, returned lightly wounded men to their unit and transferred the more seriously wounded to a Casualty Clearing Station, positioned away from the line. Now, in early July 1916, the Division was active during the Battle of Albert during which 189 officers and 5676 men were casualties In August, there were further heavy casualties - 126 officers and 2739 men - during the Division's involvement at the Battle of Poziers. These casualty numbers would be a tremendous challenge for the field ambulance units and this was to continue. Towards the end of 1916, the Division moved to the front in the Arras area and took part in further actions with still further heavy casualties7. In January 1917, the Division was assigned to take part in an intended offensive at Arras, against enemy lines in front of Douai, either side of the River Scarpe. After an artillery bombardment which opened on 4th April, the infantry advanced, on 9th April, behind a creeping barrage, some using tunnels that had been opened up to reach out of Arras itself. It appears that Private Haddon was killed during this action, while carrying out his duties amongst the wounded. Private Haddon was buried in the Faubourg d'Amiens Cemetery. 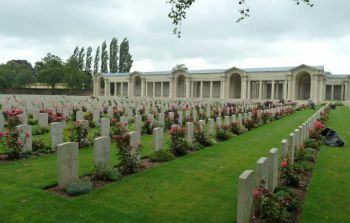 This cemetery, in the Pas de Calais region of France, contains 2,650 Commonwealth burials of the First World War, 10 of which are unidentified8. He was posthumously awarded the Victory Medal and the British Medal9. His brother Percy enlisted in August 1917 with the 10th Battalion Sherwood Foresters and was killed in action less than a month before the end of the war, on 20 October 1918.10. William Henry's Army financial effects of £4 13s 5d were paid to his father on 28 June 1917 and he received his War Gratuity of £6 on 24 October 191911. 2His birth was registered in Basford Regisration District (of which Beeston was part) in Q1/1897 (Ref 7b 236) - recorded as 'Hadden'. 3Their marriage took place at St Alban's Church, Sneinton, Nottingham on 8 August 1896. 41901 Census, Piece 3153 Folio 171. 51911 Census, Piece 20430 RD429 SD3 ED5 Sched 133. William Henry's siblings were Ida (b.1898), Percy (b. 1899), Lizzie (b. c1902), George (b. 1903) and Nellie (b. c1908). 8This description of Faubourg d'Amiens Cemetery is based on that included in the Commonwealth War Graves Commission website.